What is the purpose of the Low Sided Box Cart? 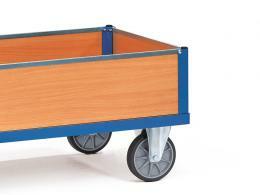 The Low Sided Box Cart is a trolley cart great for small loads around the office or work site. The cart can easily move loads from location to location without the heavy lifting. The cart handle is located in the front for easier moving around obstacles. The frame of this heavy duty platform trolley is made from welded steel for added durability. The low sides of the cart will keep cargo from spilling out. This design of pull along trolley comes equipped with 2 swivel wheels and 2 fixed wheels. The wheels can move with ease in tight areas. The tyres are made of cushioned rubber. The body of the cart is made from heavy duty particle board. 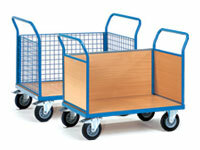 This industrial trolley cart is available in blue and comes in 4 different sizes. The weight capacity varies from 400 kg to 500 kg. The wheel diameter ranges from 160 mm to 200 mm. 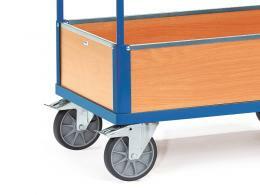 The Low Sided Box Cart can be used in the office, at a construction site, or for deliveries. The cart can be easily accessed by most employees. The cart is lightweight and is can easily be navigated throughout a space. 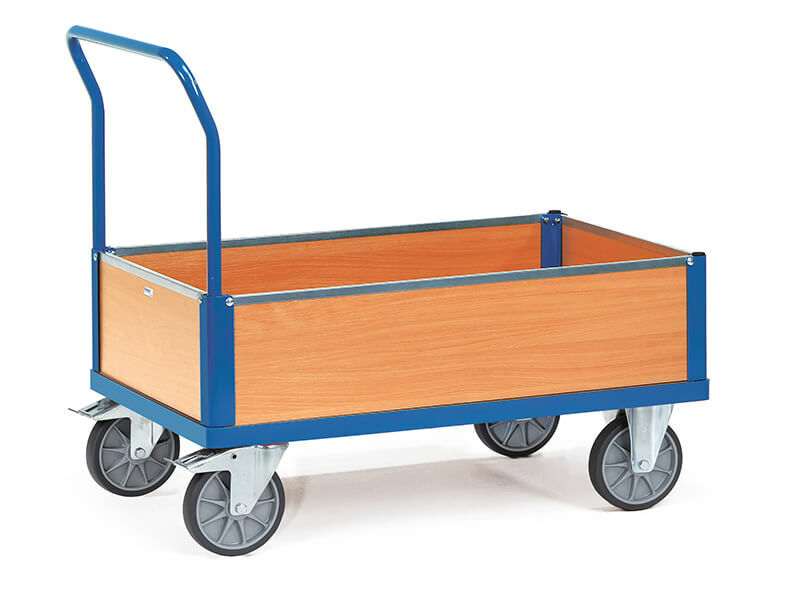 When used for deliveries, this site trolley can be stored in a van or truck. Who might use the Low Sided Box Cart? Employees of a factory, office building , or retail stores can use the low sided box cart. The cart is outstanding for making tedious loads easier to carry. The weight limit allows for larger loads to be carried with ease. Clothing, paper products, or tools can be moved with relative ease. The Low Sided Box Cart is made from quality materials and meets euronorm 1757-3 standards.